If having “satisfied” customers was all it took to grow, mortgage bankers would be in heaven. But it’s not enough. Why? Because satisfied customers aren’t necessarily loyal customers. Studies over the last few years show that overall customer satisfaction with the Mortgage Banking industry – at an average score of around of 70 percent – lags the overall financial services sector by about 5 percent, based on data from the American Customer Satisfaction Indexsm. While this doesn’t sound so bad, consider that just under 30% of the average retail bank’s customers will consider it for future deposit or credit products,1in spite of regular satisfaction metrics in the 80 to 90 percent range. To make matters worse, among those that do track customer satisfaction, 60 to 80 percent of lost customers surveyed have claimed to be “satisfied” or “very satisfied,” just prior to defecting. 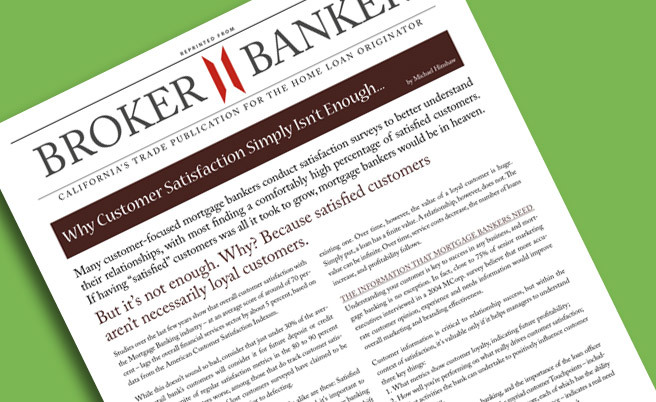 The lessons for loan officers and mortgage banks alike are these: Satisfied customers aren’t nearly as valuable as loyal ones. And it’s important to measure how well you’re doing, so you can improve. The mortgage banking industry continues to change, as volumes decline and transactions shift from refinancing to purchases. That’s why understanding the differences between “satisfied” and “loyal” customers may be crucial to continued relationship – and transactional – success. Unlike customers who are merely satisfied, loyal customers are those who stick with you over the long term, even if they’re not getting the best price. They tend to transact and invest more over time, and devote an increasingly larger “share of wallet” to a loan officer they feel good about. They are also those customers who will tell their family, friends and business associates about their experience. This tendency of loyal customers to drive new business is exceedingly valuable, as they dramatically lower the average cost of acquiring new customers. At the same time, they’re more likely to forgive the occasional faux pas, decreasing churn. The economics are compelling as well. On the front end of a relationship, it can cost 5 to 6 times more to acquire a new customer than to keep an existing one. Over time, however, the value of a loyal customer is huge. Simply put, a loan has a finite value. A relationship, however, does not. The value can be infinite. Over time, service costs decrease, the number of loans increase, and profitability follows. Understanding your customer is key to success in any business, and mortgage banking is no exception. In fact, close to 75% of senior marketing executives interviewed in a 2004 MCorp. survey believe that more accurate customer opinion, experience and needs information would improve overall marketing and branding effectiveness. What activities the bank can undertake to positively influence customer loyalty saying. The complexity of mortgage banking, and the importance of the loan officer and their relationship in managing the myriad customer Touchpoints – including title companies, realtors, appraisers and more, each of which has the ability to positively or negatively affect the customer experience – indicates a real need to understand where things are working, and where they aren’t. The greatest stumbling block to gathering customer feedback is often internal. In short, there needs to be buy-in from all levels of an organization, particularly executive management, to the use of this type of information as a component of business strategy. While understanding the answers to these questions may be critical to success, the organizational structure and culture of many mortgage banks doesn’t lend itself to this type of introspection. This is why the key to gathering customer feedback is determining which approach best fits your organization. No measurement program will succeed unless the business goals are clear, the system for gathering, analyzing and reviewing information is well-defined, and the results drive meaningful business decisions. This “mindset” is an important part of shifting to a more customer-centric approach to selling and delivering mortgage-based products and services, built around giving customers want they want as opposed to what you’re able to sell them. To understand how your customers really feel about your firm, it’s important to ask the right questions. “What’s your overall satisfaction” is an interesting question to ask, but it simply won’t help you predict future financial performance or the actual quality of your customer relationships. We believe that one question – your customer’s likelihood to recommend your company to friends and colleagues – is all you need to measure to understand customer loyalty and drive financial growth. By regularly measuring your customers “likelihood to recommend”, you can begin to form an accurate picture of the quality of your relationships. Once you know where you stand, the most important thing to do is improve. In our experience, this means getting to the root issues that drive satisfaction for your customers. This means developing an understanding of the interactions, attributes and Touchpoints which are most important to your customers (the “drivers of satisfaction”), and measuring your performance against each of them against their importance to your customer. By measuring both loyalty and the drivers of satisfaction – and improving your performance on key metrics – you and your firm will enjoy a clear understanding of where customers actually stand in their relationship with you, and where you may be in danger of losing them. The results? An understanding of your customer relationship that doesn’t just sound good, but that can actually help you reduce churn, increase profitability and referral business, and predict future relationship performance. Through this understanding, and a culture that encourages taking positive actions as a result, you’ll be in a position to build real value, improving retention and cross-sell while building relationships that will reward you for years to come. Though self-evident, sometimes the fact that all customers are NO T created equal doesn’t get factored into the time, energy and cost of building customer relationships. Understanding loyalty metrics across all your customers is key to longterm relationship building. At the same time, investing in increasing this loyalty should be focused. To profitably improve service delivery and increase loyalty for your customers, your firm must intimately understand the financial and satisfaction metrics associated with each individual customer segment. Understanding the relationships between service levels, profitability, satisfaction and loyalty allows you to focus limited time and resources on improving the experience for the most valuable customers. At the same time, less valuable customers can often be well served with less expensive Touchpoints that still make it easy to do business, while increasing overall satisfaction and loyalty levels and adding value to each interaction with a customer. To achieve a measurable return on your customer relationship investments, you need to intimately understand the needs and associated economics of each customer group throughout their Customer Relationship Lifecycle. This includes identifying the cost of acquisition, customer lifetime value, service and retention cost, purchase tendencies and other key metrics, for your customers. With this information, you can identify your most valuable existing and potential customers, and understand the metrics of your other customer segments as well. This also lets you tailor appropriate offerings and service levels for each. You can make better decisions on how to deploy resources knowledgeably, ensuring that all offerings, communications, and interactions are delivered at the highest appropriate level of quality. Just as we believe that delivering a positive customer experience (at every Touchpoint, for every segment) is critical to building and maintaining relationships and increasing customer loyalty, we also believe that service delivery and relationship-building investments based on a given segments value is simply good business. An innovative management and marketing executive and educator, Mr. Hinshaw has over 20 years experience in marketing, brand and management consulting, with emphasis on business-to-business and financial services. He has enjoyed a rich career building and growing businesses, becoming an authority on brand and marketing planning and performance measurement in these areas. Currently Managing Partner of strategic brand and marketing consultancy MCorp, his experience also includes roles as President/ CEO of a publicly traded company, and a graduate level marketing professor. McorpCX clients range from funded start-ups to the Fortune 500. Their Loyalty Mapping® research methodology helps firms measure and improve customer loyalty, and firm performance, on key drivers of customer satisfaction.